Yes, I did take that photo. Yes, it really does look like that. Golden spires sweeping elegantly towards the sky from a sheer rocky outcrop on the side of a volcano, accessed by a 777 step covered walkway. This is Taung Kalat Monastery, situated under the imposing shadow of Mt Popa just a 50km drive south-east of Bagan, Myanmar. And it looks like a fairy-tale castle. 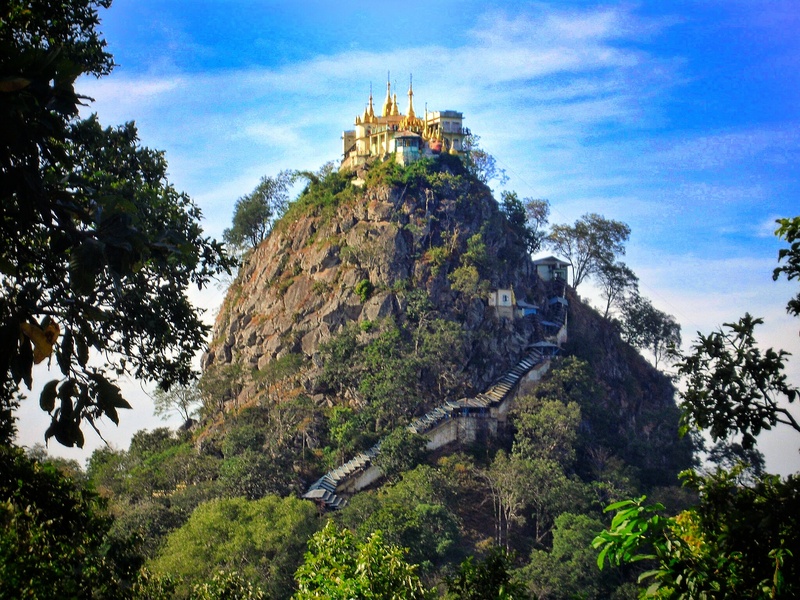 Mt Popa is an easy half-day trip from the temple-covered plains that draw so many people to central Myanmar. I met a driver while I was poking around a ruined temple who was keen to take me on a visit, so I grabbed a couple of other travellers from my guesthouse to split the cost, and arranged to meet the next morning. The monastery is home to 37 different Nat spirits, and as we approached the lushly green, steep-sided mountain, our driver paused to offer up a short prayer to the spirits to ensure our safe passage. He did this by stopping in the middle of the road and closing his eyes briefly, hands lifted from the steering wheel – possibly not the greatest move ever made in the name of safety. We reached the base of the covered stair in the midst of a procession on monks receiving alms – not the sedate, stately affair you might imagine but a lively, raucous event, filled with colour and vibrant movement. Through the commotion, we found our way to the bottom of the stair, removed our shoes, and began to climb. There were monkeys everywhere, the sort that are at once rather cute and kind of scary, with their soft fur, large teeth and curious yet aggressive demeanour. Giving them a wide berth, I made my way to the top of the structure. The view from the top is gorgeous, the wide, flat plain stretching off to the hazy horizon. 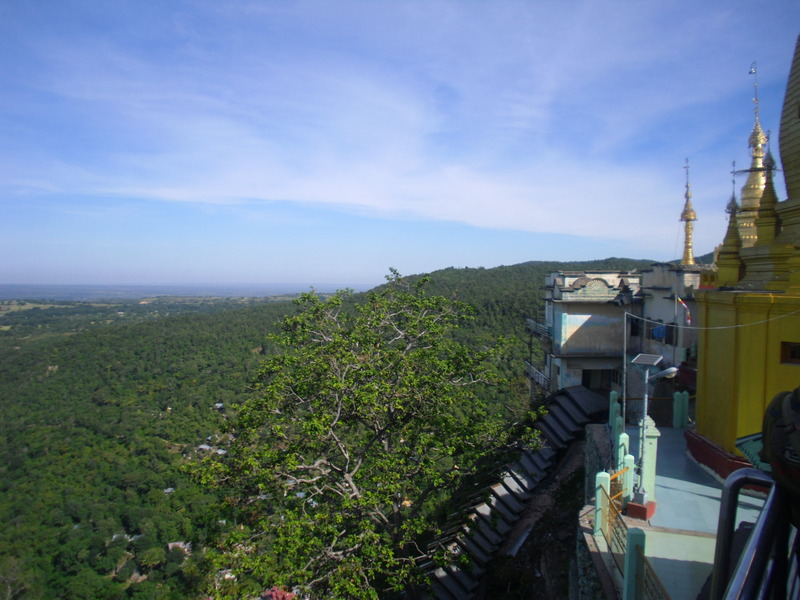 The trees are punctuated by golden stupas, and the shadow of Mt Popa pulls the eye to its caldera – it is, after all, a dormant volcano, and we are standing atop a volcanic plug. The temple is intricately carved, with Buddha statues sitting sedately amongst the sprightly nat figures. As far as temples in Myanmar go, it’s not unusual or especially grand – but what really makes this place special is the location, and the steep cliffs that peal off in every direction. Exactly how it was built, I can’t begin to imagine. Back at the base of the hill, I met our driver in a tea shop, and we drank fresh green tea while we waited for the others to find us, watching the commotion in the streets and sharing stories. He’s a fascinating guy – but I’ll tell you some of those stories later.